High quality dining table sets with long service period are characterized by quality production materials: wood, tempered glass and steel are one of the most widely used ones. Regardless which style you prefer — classic, country or contemporary, make sure the material used in the production matches your dominant interior theme and colour palette. And if you want a dining table to serve you for decades, go for solid oak units – these truly timeless solutions are unlikely to ever go out of fashion. If your budget is limited, you may go with quality MDF with wood effect, though in this case you will have to settle for shorter service period. This is especially relevant, if a dining table of your dining table set has a glass top. 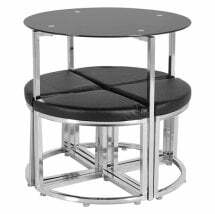 Make sure the table surface is made from quality tempered glass, which is highly solid and will sustain a lot of pressure, and go for round table shape or at least a unit with rounded edges. The edges of tempered glass tables should have rubber, plastic or wooden lining, to protect you and your kids from getting hurt. One of the ways to ensure safety, is to shop for units made from non-toxic natural quality materials, such as the above mentioned glass, steel and natural wood. 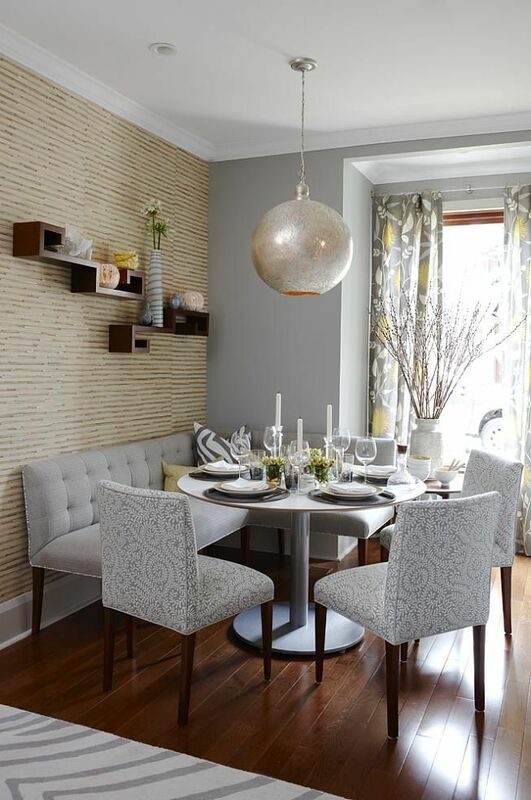 Space-efficiency is another essential feature most quality dining table sets for small spaces should have – if your kitchen or dining room space is limited, go for folding or extended units. Keep in mind, that accommodating additional seaters means you will need more chairs, so make sure to buy at least two extra chairs to match your dining set. Speaking of dining chairs, regardless whether or not they have armrests, the chairs, above all, should be comfortable to sit on. Nothing should distract you as you are having breakfast or engage in a friendly conversation at a lengthy dinner party, so the chairs should be cosy – at the very least. Pay attention to the chairs’ upholstery – faux leather may look great, but feel sticky and unpleasant on hot summer days. In general, it is advisable to go for natural fabric or leather upholstery — it will ensure longer service period and is easy to clean. Even if you go for an MDF unit, great assembly and build will ensure its durability and extensive life span. Of course, checking assembly and build is hardly possible if you buy furniture sight unseen, so, if you shop online, choose in favour of respectable stores that have showrooms you can visit in person. An example of such local furniture store is Furniture in Fashion . This e-commerce platform offers a vast range of quality dining table sets from trusted UK and European manufacturers and invests in its own couriers, vehicles and showrooms to ensure great shopping experience. Most importantly, the quality of furniture it sells is impeccable and the prices are reasonable and highly competitive.